The latest proprietary performance fabric from Medelita boasts a large number of technological features, from wrinkle a fluid resistance, to bacteriostatic properties. But what does bacteriostatic really mean, especially compared to other similar words like “antibacterial” and”antimicrobial”? All day, every day, you are shedding skin cells that get trapped between the fibers of your garments and trap bacteria – this is what causes musty odors that get trapped in your clothing. Fabric made with bacteriostatic properties naturally these skin cells so that they simply fall off your clothes, instead of becoming trapped. The result? An odor free lab coat experience! When it comes to performance fabrics, brands claiming that their products are antibacterial or antimicrobial are right – sort of. The problem is, that technology will wash right out of your clothing after just a couple times through the laundry – converting your “performance fabric” back to just regular old fabric. 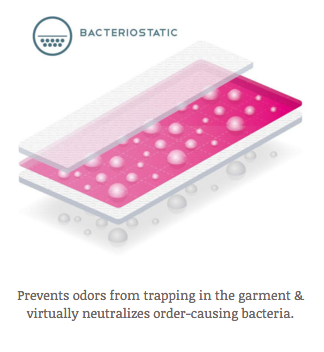 In contrast, fabric that has bacteriostatic properties will never wash out, because this feature is actually embedded into the fibers of the fabric itself. It has to do with the way that the fiber is woven, in a way that dead skin cells cannot cling to the fabric. This entry was posted in Lab Coats, Trends In Medical Apparel and tagged Bacteriostatic, Lab Coat Fabric, Performance Fabrics on April 1, 2016 by Ariel Jacoby. I’d like to have a discussion on the possibility of having your products or fabrics in Ghana. Hello, thank you for your interest. Please send us an email at contact.us@medelita.com to learn more about our international retail opportunities!